Malling Abbey Mark Lodge No.1425 held a Valentine's Ladies Supper on Saturday 6th February which over 60 Brethren with their wives and guests attended. The evening was organised by Bro. Alan Jenner, Lodge Treasurer and W.Bro. Pete Hayler, Lodge Charity Steward, on behalf to the WM Fred Stratton. Guests enjoyed a four course meal and £300 was raised for Charity. At the same time a little silver teddy bear was passed round for small change which raised £40 for the TLC. Each Lady was give a Red Rose to celebrate Valentine's Day. The first picture shows a general view of the guests enjoying the evening. The second picture shows W.Bro Fred Stratton pouring the wine to toast the Queen. 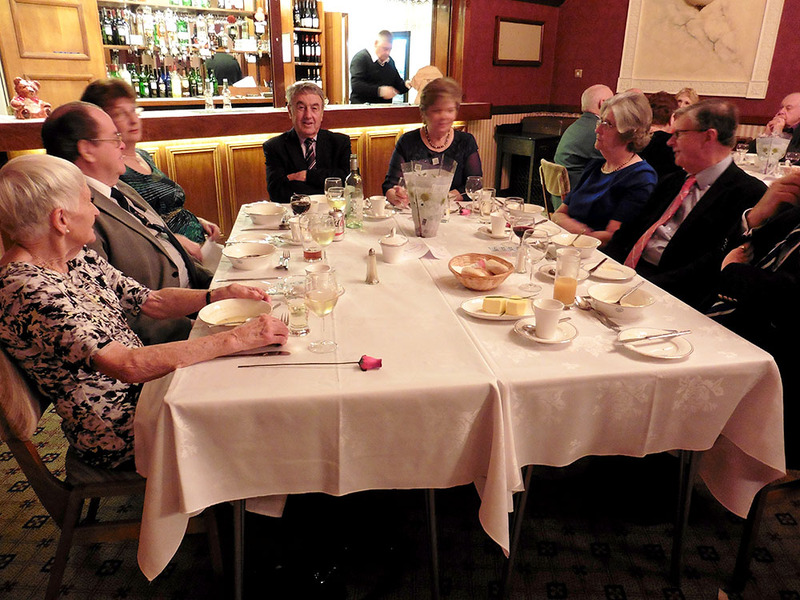 The third picture on a second e-mail shows W.Bro Bill Laidler, Retired Assistant Head Master of Mascalls School, Paddock Wood, and Past Master of the Lodge holding court at the supper.